This website is reproducing below a review penned by Cecilia Xuereb which was published on The Malta Independent on Sunday 16 November 2014. Exactly 20 years after their first performance of Verdi's opera Nabucco the Teatru Astra in Gozo presented the opera as part of their annual culture festival Mediterranea. This time round increasingly sophisticated technology has enabled artistic director Enrico Stinchelli to create an on-stage spectacle that in its way equals that of big theatres known for their productions of grand operas like Nabucco. Stinchelli's production of Verdi's opera at the Astra Theatre during the last weekend of October went beyond that of his earlier productions at the theatre. Against a background of ever-shifting colours, colour patterns and projected sets, figures materialised out of nothing creating very powerful effects. Stinchelli sees the score of the opera as "full of fire and brimstone" characteristics that he fully brought out in his direction. The main characters move inside this setting which, "with its play of light and myriad effects", is no mere background. These effects are even reflected in the sumptuous colours of the costumes of extras, choir and principals with deep blues and gold marking out the Babylonians and white marking the Jews. Nabucco, one of the earliest of Verdi's operas, already has the mark of the composer's unfailing ear for melody as one memorable tune follows the other right from the symphonic overture which is melodically a synthesis of the whole opera. The choir plays a very important part in the opera and is often regarded as its true protagonist dominating several of the strongest scenes and often entering with stirring effect at climactic points in many of the solo numbers. The Teatru Astra opera chorus, trained by Maria Frendo, was impeccable, at least on the first of the two performances. Sensitive to both the music and to the action of the score and the libretto, it was a vital element in the production. The only time when I felt that it was not dramatically integrated into the action was when it stood pyramidically facing the audience to sing the famous Va Pensiero chorus looking more like a monument than a group of pilgrims. The central figure of the opera is Abigaille, beautifully sung and played by Silvia Dalla Benetta. Vocally secure, agile and dramatic at the same time she sailed through this difficult part with great confidence. Her aria in Act II O fedel di te men forte had a sinuous elegance that contrasted with the vehemence of her opening aria in this act Ben io t'invenni o fatal scritto. With her flaming red hair she dominated every scene in which she appeared. Rather unusually for Verdi, the male protagonist of the opera is not the tenor. The score offers excellent opportunities for the baritone and the bass in the roles of Nabucco and Zaccaria respectively. Baritone Piero Terranova in the title role came into his own at the end of Act 2 when he shed his puppet-like mask, which rather hampered his tone projection. Following his nemesis at the hands of the supernatural he became a more credible figure as he portrayed success over failure. His remarkable solo at the beginning of Act IV, Son pur queste mie membra, showed what this singer is capable of doing. Appearing at the beginning as a Moses-on-the-mountain-figure complete with the tables of the law, bass Carlo Colombara (Zaccaria) had a fine beautiful line in his singing, a foil to Dalla Benetta's Abigaille. His prayer Tu sul labbro had the striking solemnity that is characteristic of this role. As Ismaele and Fenena providing the love element of the plot Maltese tenor Cliff Zammit Stevens and mezzo-soprano Olga Sliepnova were equally impressive with their fine voices and beautiful singing. 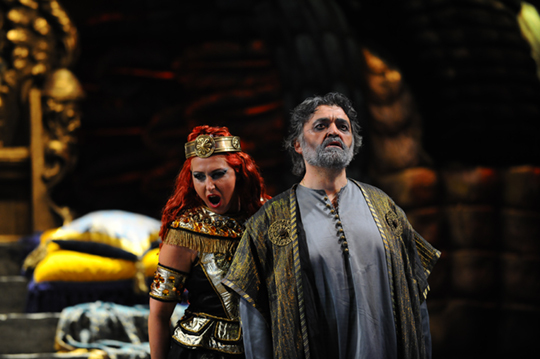 Soprano Dorienne Portelli as Anna, bass Louis Cassar as the High Priest and tenor Mario Portelli as Abdala completed the line-up of the singers. The Malta Philharmonic Orchestra under Joseph Vella after a rather weak start with an insecure horn solo warmed up to the performance interacting with the singers on stage. A fine souvenir programme complete with libretto (in the original Italian and in English), an erudite article about the romantic movement in Italy by Dr Maria Frendo and one about the major recordings of the opera by Joseph Camilleri, adds on to the fine collection of opera programmes from previous years. 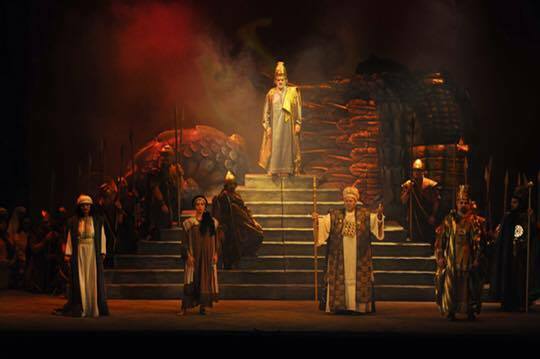 Nabucco was the main item of the 13th edition of the Festival Mediterranea, which includes concerts, exhibitions, lectures and guided tours.